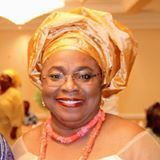 Dr. Clara Ada Ogbaa from Umuenebu, Ufuma, Orumba North LGA. She is the Director of Library Services at Gateway Community College, New Haven Connecticut, USA and a former adjunct faculty at the department of Information and Library Science, Southern Connecticut State University, New Haven CT and where she also served as an Associate Professor and Coordinator of Library Instruction at Buley Library for twelve years. She worked as an administrative librarian and the Head of Reference and Instructional Services at Texas State University, San Marcos. She was the Assistant National Secretary for ASA Women USA, 2013-2016 and the current Project Chair as well as attended the 2016 Medical Mission.